You might be thinking that this being my first blog post in over a month is harshly named. Well you are probably right, it’s not that I loathe being back in Britain, but I’ve been here for about month and I’m just doing the same old thing. Yes, it is great to be home! I’m enjoying seeing my friends, as it might be the last time for awhile before I leave for the other side of the world. I am over the moon with having my mum and dad look after me! There’s nothing like the feeling of not having to do your own washing, cooking, and just generally having to look after myself. It’s great, I don’t have to think. It’s comfortable. Comfortable. There’s the root of the problem. This is where the title of the blog post is apt. This is where the banality lies. It’s like purgatory. Waiting for the next step. The conventionality of normal life has set in, and the long process of amassing documents to jet off to Asia leaves me having to get used to this normality for awhile. All I know is that I have to get off this island. Believe me, I am trying! I have applied to various places and I am just waiting to hear back! But hey, it hasn’t been completely dull! I have just recently had my first job as a qualified TEFL teacher at Concorde International Summer School in Ashford, Kent. 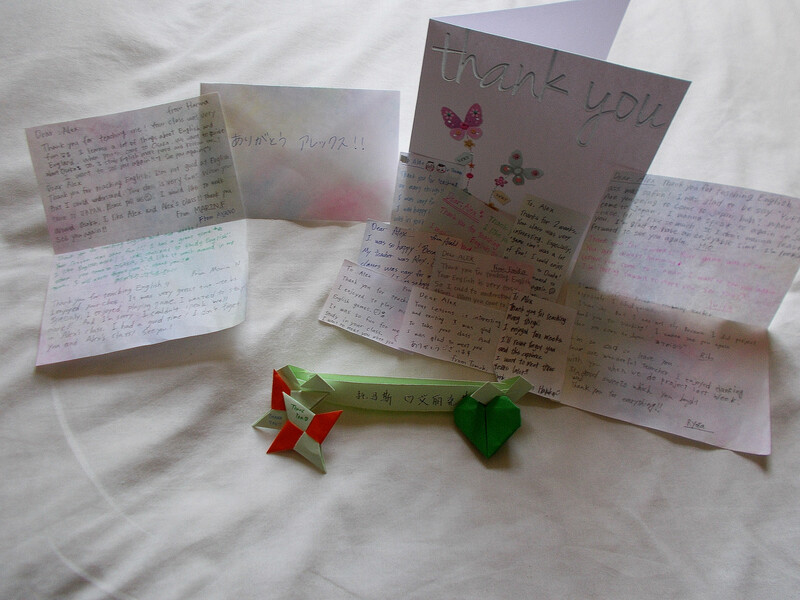 I had the pleasure of teaching a mix of Japanese and Chinese teenagers for two weeks. I have to say, as my first TEFL employment, it was pretty fun! The students seemed to enjoy themselves, considering I received lots of thank you notes (love letter of course) from the whole class, and I also enjoyed the two weeks! It was amazing to see the progression of the students over the span of two weeks. From the silence of the shy class over the first couple of days, to bringing out their charisma and struggling to keep them on the topic of conversation! Although it was only two weeks it was still a great experience for me! I hope my next experience of teaching Asian students is just as enjoyable and rewarding as this one! So there you have it, I’ve pretty much summed up my last month for everyone who reads this! I hope everyone is doing well! Speak to you in another month (hopefully sooner, can’t promise a thing). Previous Previous post: Prague; TEFL approved… Czech.